Hall of the Mountain King: Review: Iron Maiden, "Flight 666"
At first glance, 23 shows in 21 cities over the course of 45 days doesn't seem so unusual for a touring band. Some who play a show in a different city every night might call it a light schedule. That is, until you consider the fact that those 21 cities are on five different continents and often thousands of miles apart. 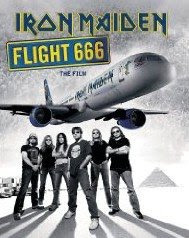 For their 2008 "Somewhere Back in Time" tour, the subject of the new documentary "Flight 666," Iron Maiden took to the skies in a Boeing 757, dubbed Ed Force One after the band's mascot Eddie. The plane was piloted by vocalist Bruce Dickinson, a licensed airline pilot, and hauled the complete tour staff and equipment in jumps that took them to all corners of the world over the course of a little more than six weeks. After opening with the packing of the plane and first take-off, "Flight 666," is an engaging film on several levels. Directed by Sam Dunn, who also did the acclaimed "Metal: A Headbanger's Journey," the documentary offers a rare glimpse of the inner workings of Iron Maiden. The band has rarely opened up about what goes on behind the scenes. Far from the hard-partying craziness that bands often use as backstage material on DVDs, here we get to meet bassist and band leader Steve Harris' family, who he takes on tour with him. In their off time, they're playing golf, tennis and soccer at various locations around the globe. It's not exactly scandalous material, but it is interesting. There are the expected interviews with the band and crew and some gorgeous aerial shots from around the world. There's also plenty of energetic live performance clips which are impressive. The power and energy of a live performance is often hard to translate to film, but they work wonderfully here. One of the most striking moments on the record is when the band launches into "Fear of the Dark" (the only non-'80s track) and a stadium full of people start singing the melody line together. It gives you, at least, a little taste of what it might have been like to be in the crowd. The set list (each song played in a different country) is also pleasantly surprising. The tour was focused on the band's material from the mid-1980s, and includes some gems like "Revelations," "Rime of the Ancient Mariner," "Moonchild" and "Clairvoyant," which the band doesn't often play anymore. The real power of this documentary, though, is its look at the band's fans around the world. The viewer gets to meet Maiden fans of all walks of life, from celebrities like Tom Morello of Rage Against the Machine and Lars Ulrich of Metallica backstage in California, to everyday fans in India, Costa Rica, Columbia and Chile, who are thrilled to get to see the band for the first time, to a minister near Sao Paulo, Brazil, whose body is covered with Iron Maiden-related tattoos. One of the most powerful images on the DVD is after a show in South America where the camera focuses on a fan holding a drumstick, brought to tears by the emotions of the show. Your first thought might be, "Dude, it's just a concert," but when you think about it, it kind of puts things in perspective a bit. Most of us take something like being able to see a rock concert for granted, but for this young man, it was perhaps one of the biggest events in his life. It's also striking, considering that Maiden's heyday was in the 1980s, how young the audience was. There were a few older folks like me scattered around the crowd, but, as members of the band marvel at several times during the movie, the front rows look pretty much like they did in 1985. 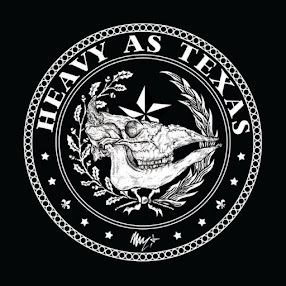 While they've certainly earned enough respect in the metal world to sit on their laurels and phone things in like so many other bands, the performances captured on "Flight 666" are not those of a nostalgia act. They're living, vibrant performances, perhaps some of the best that Iron Maiden has put on stage in years. The second DVD in the set is dedicated entirely to the performances, showing each in its entirety. For Maiden fans, or those new to the band that want to get a good overview of music from the band's most powerful era, "Flight 666" is a must-have. Get "Flight 666" on DVD. Get "Flight 666" on Blu-Ray. Get "Flight 666" on CD.